Are you ready for this? I read the Book of Mormon 17 times on my mission. On the second month of my mission my President asked us to read it cover to cover each month and I did. It's 20 pages/day. Needless to say, an LDS mission is the perfect time to attempt that since you have an hour each day dedicated solely to personal study. Since my mission? Not so much. If you’ve read my book you’ll know how hard things became and all the people I lost after I joined the church. There were some times that my co workers and my boss would lock me in their office and make me watch all of these terrible videos about the gospel and they would yell at me telling me I am a terrible person and what I am apart of is wrong. How hard that was just being baptized and felt like I was being punished for it. I didn't know what to do or how to defend myself because I only knew of the church for only a few weeks, how small my knowledge was. 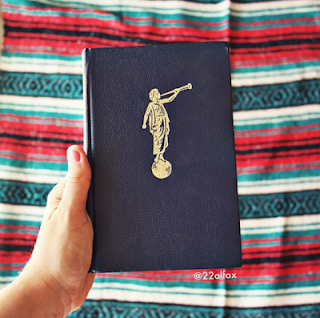 Every time things got hard, literally every spare second I had of every day, I would read the Book of Mormon. Not once did my situation change because of it—not really— but every single time I would receive the strength and the knowledge to be able to handle what I was going through. I don't know what I'd do without that book. That is where strength and happiness comes from. I'm hoping a lot of our goals for the new year is to read more from scriptures. And I definitely know it's not about how fast we get through them, but knowing the strength and revelation that comes from reading, it should be about how often we read so we can receive even more to help us best. The reality is you have a spirit living inside of you and it’s crucial to feed it. Easy things to do.... CLICK HERE to continue reading!